Big bass are just as easy to catch as little bass when you know where to look! Matt explains exactly how these fish move, why they're transitioning, and how to take advantage of their feeding habits along the way. This is the culmination of our videos on early Spring bass fishing, you don't want to miss it! We've already discussed early spring bass movements along secondary points and structures. We've also looked in depth at a variety of lures and presentations that are effective in Spring. Today we're focusing in on how and when to specifically target schools of bass. Using the tools you've learned you can trigger schools of bass into a feeding frenzy then cycle through a handful of baits (examples are below) to keep them feeding as you work through the numbers in search of that fish of a lifetime. Below is a breakdown of our confidence baits for this style of fishing. Keep in mind that whether the bass school shallow or deep varies fishery to fishery, so we'll offer our favorite picks for both scenarios. We'll also include the exact equipment that was catching the bass in today's video. Which Bluegill Swimbaits Catch More Bass? Amazing Underwater Fishing Footage!! Which Bluegill Swimbaits Catch More Bass? Let's go underwater and find out! There are a ton of bluegill imitators on the market but some have terrible hookup ratios. Today we explore which baits get the most bites, which hook up the best, and when to throw them. Whether you're sight fishing for spawning bass or blind casting for aggressive post spawn bass that are eating bluegill, these baits will help you catch more fish. Its no secret that bass love to eat bluegill. They're a consistent food source from coast to coast but imitating them can be very difficult. The key is to focus on baits that have smaller profiles and either have an exposed hook or are so soft that a hidden (weedless) hook can easily pop through. Over the years we've narrowed our selection from dozens of bluegill swimbaits to just a handful of bluegill imitators with great hookup ratios. Below is a breakdown of the baits we use when bass are chasing bluegill. All of these baits can be used for bed fishing or open water casting alike. Don't get caught up with colors, instead focus on profile and action as you select the best baits for your lake. Matt returns to where he caught his 17 pound bass for the first time in a decade and catches a 10 lber!!! Come along for a day of Spring Bass fishing on the Kayak as the guys explore a new (old) lake and piece together the bite. 3 completely different patterns emerge during the course of the day. They guys catch fish throwing a big swimbait, a jerkbait, and a creature. We've said many times before that the key to successful Spring bass fishing is being willing to adapt. Being willing to leave biting fish in search of bigger bites is also important. 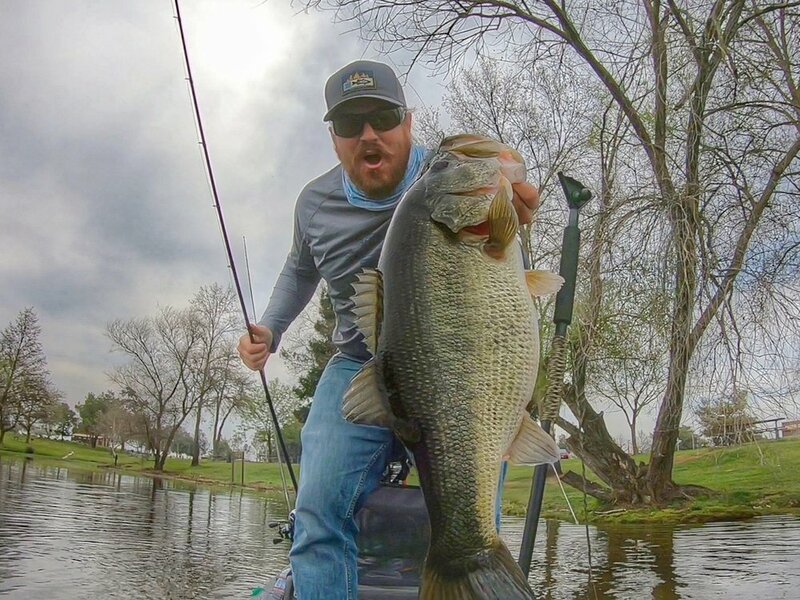 Matt said "It was truly incredible to return to a lake after such a long break and find the bass in similar locations, willing to bite similar lures. It was as if the years had never passed." While history fishing (fishing a spot or a lure based on unrelated past experiences) is often looked down upon there are times when it can be incredibly effective! History fishing is a great starting point as long as you don't stay locked in to those previous patterns when they're not producing. Below is a breakdown of the baits and gear the guys were using during the day on the water.